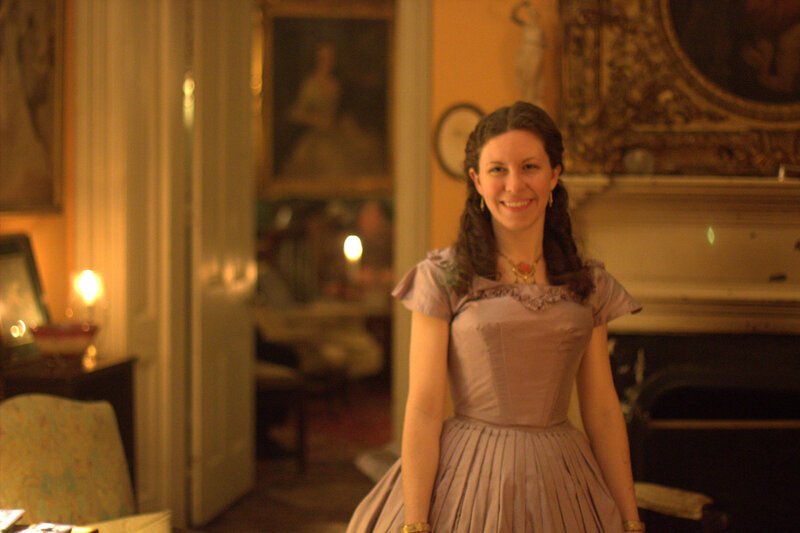 This past weekend I attended a lovely event in a period mansion that required an 1860's evening dress. Since I was making myself several other items for the event, my options for an evening dress were limited to using pieces that I already owned. This silk dress seemed perfect for the occasion because it had such beautiful scalloped and gathered trim on the skirt. The skirt trim was in poor condition though from years of wear, and I had a day bodice that was too large and a ballgown bodice that was too fancy, so I had to get creative. The skirt trim had to be completely rescalloped - a task that was quite time consuming. There were small scraps remaining from the construction of the dress, and these were just perfect for creating an evening bodice. An evening bodice pattern was created from the darted day bodice that I had. The closure was moved from the center front the the center back, and a mock up was created to determine the depth of the neckline. Trim was cut on the straight of grain and scalloped with scalloped pinking shears, hand gathered, and applied to the bodice by hand. There was not time to attach the bodice to the skirt, but this will be finished in the future. The dress was worn with an antique gold necklace, gold bracelets and earrings and an original 1860's pink silk and bone fan with gold spangles and pink marabou feathers. My mother, Nancy, also attended the event and wore her red checked silk transition dress for the evening. She basted the pagoda sleeves in place and opted to wear it without the matching pelerine. She wore an antique gold necklace with it, silk organza undersleeves, and carried a bone and silk fan with gold spangles. A wonderful evening was had by all. We dined on the back porch of the mansion by candlelight, had a multi course meal on fine china with beautiful silver candelabra's on the table. The weather was perfect and we could see the moon shining high above us as we dined. Afterwards we retired to the parlor for a game of question and answer, conversation, and a bagpipe performance. It was a delightful and magical evening. Love it! Any tips on how you cut the scalloping? It is all pinked yes? For the skirt scalloping I created a template, marked the scallops on the silk with chalk, and cut with regular scissors (not scalloped or pinking shears). The trim on the bodice was cut with scalloped scissors - I found a vintage pair online. If you ever choose to do this much scalloped trim on a skirt, leave yourself plenty of time because it takes FOREVER to cut all of the scallops, and you'll want to take breaks so that your hand and wrist don't get injured doing that much cutting.